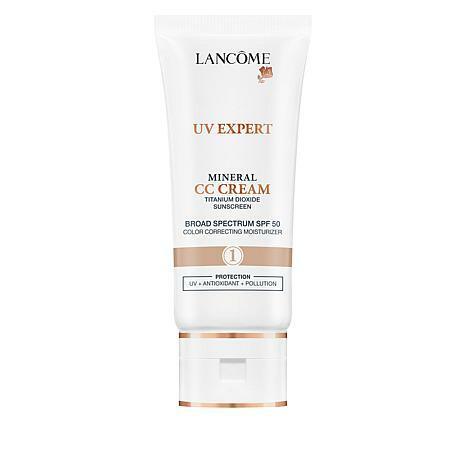 An all-in-one color corrector, tinted facial moisturizer and SPF 50 sunscreen that provides transfer-resistant color, medium-to-full makeup coverage that lasts all day, with 24-hour skin hydration and broad spectrum sun protection and antioxidants to fight free radical aggressors. Use daily after cleansing as a tinted moisturizer and as an alternative to a foundation. For SPF protection follow product label directions. Use it like regular facial moisturizer with your fingertips, starting at the center of the face and blending outwards, evenly spreading the formula to moisturize, protect and minimize imperfections in all facial zones. For more coverage, build the CC Cream. For fuller coverage makeup, apply the CC Cream with a foundation brush. In case of contact with eyes, rinse them immediately and thoroughly. WATER, DIISOPROPYL SEBACATE, IRON OXIDES, GLYCERIN, ALCOHOL DENAT., ISOPROPYL PALMITATE, CAPRYLIC/CAPRIC TRIGLYCERIDE, PROPANEDIOL, DIETHYLHEXYL SYRINGYLIDENEMALONATE, POLYGLYCERYL-6 POLYRICINOLEATE, ISOCETYL STEARATE, ALUMINUM HYDROXIDE, STEARIC ACID, FRAGRANCE, TOCOPHEROL, SODIUM BENZOATE, STEARALKONIUM HECTORITE, TRIETHOXYSILYLETHYL POLYDIMETHYLSILOXYETHYL DIMETHICONE, POLYHYDROXYSTEARIC ACID, MALTODEXTRIN, XANTHAN GUM, PENTYLENE GLYCOL, MENTHA PIPERITA (PEPPERMINT) EXTRACT, ISOPROPYL TITANIUM TRIISOSTEARATE. PROPYLENE GLYCOL. LEONTOPODIUM ALPINUM FLOWER/LEAF EXTRACT, CAPRYLYL GLYCOL, MORINGA OLEIFERA SEED EXTRACT, SORBITOL, ROSA GALLICA FLOWER EXTRACT, CITRIC ACID, POTASSIUM SORBATE, ALUMINUM STEARATE, ALUMINA. A world leading French beauty authority, Lancôme presents the best of beauty. From expert skincare to catwalk-inspired makeup, discover award-winning products and coveted must-haves that reflect the ultimate in advanced technology, sensorial pleasure and fabulous French flair. Remind me about Lancôme upcoming shows.